Everyone wants to accomplish their goals and live the life of which they dream. But in today's busy age, how do we make that happen? This interactive book helps readers live an intentional life by determining their priorities and tapping into their creativity to create beautiful and functional vision boards and manageable action plans to achieve their goals. 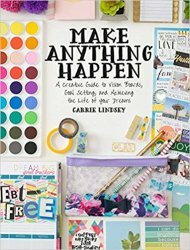 Through guided worksheets, vision board templates and samples, and planning pages, author Carrie Lindsey inspires readers to get clear on what they really want and then make it happen. Getting your life in order has never been so much fun! What would happen if you set aside a little time to write down what makes you excited and what drags you down? What if you took it a step further and set specific goals for living your best life? What if that process could be creative, exciting, and lead to actual change? Change is hard, but it's worth it. And with this book, it's also a heck of a lot of fun. Readers also have access to a private Facebook group full of members who are working towards living their dreams.